Pakistani Prime Minister Syed Yousuf Raza Gilani on Monday said all issues with India, including the withdrawal of troops from Siachen and the Kashmir dispute, must be resolved through dialogue. Burmese democracy leader and Nobel Peace Prize winner Aung San Suu Kyi will be finally able to pick up the prestigious honorary doctorate she was awarded by Oxford University when she visits the UK later this year. She is also travelling to Norway this summer, where she will formally accept the Nobel Prize she was awarded back in 1991. Francois Hollande charged back into campaign mode today with momentum on his side to capture France's presidency, after the Socialist won the most votes in the first round of voting that put him into a run-off with conservative incumbent Nicolas Sarkozy. The Murdoch media in Britain continued to suffer knocks with a new probe being launched today into news-gathering practices at Sky News while the father-son duo prepared to appear before the high-profile Leveson Inquiry this week. Dutch Prime Minister Mark Rutte tendered his government's resignation on Monday in a crisis over budget cuts, creating a political vacuum in a country which strongly backed an EU fiscal treaty and lectured Greece on getting its finances in order. “I strongly believe that better sense will prevail on both the sides and we will resolve these issues through dialogue," Gilani said in his address at a conference on 'Role of international NGOs in relief and development in Pakistan'. The conference attracted delegates of the Muslim Hands International (MHI), an NGO, from 40 countries, including European, African and Asian nations. Gilani said the era of warfare had ended and it was the time to settle issues with other countries through negotiations. He recalled that at the time he assumed office in 2008, Pakistan's relations with India, Afghanistan and Iran were not satisfactory. However, he said, he took the initiative in normalising the relations with India, in particular, and met Indian Prime Minister Manmohan Singh at an international summit and stressed for pursuing the dialogue policy. Gilani said it was agreed in his several meetings with Singh that the issues like Kashmir, Sir Creek, Siachen, water disputes and terrorism, could be resolved through political will. India and Pakistan resumed their peace process last year after a gap of over two years in the aftermath of the 2008 Mumbai terror attacks, which were blamed on the Pakistan-based Lashkar-e-Toiba. Since then, the two sides have taken several steps to normalise relations, especially in the field of trade. Gilani appreciated the services of the MHI in more than 50 countries in the areas of development, reduction of poverty, promotion of education and rehabilitation of the people affected by natural and man-made disasters. He said with the challenges of resource constraints and the needs of growing population, it was virtually impossible for the governments to undertake the social development in holistic manner. He said despite all constraints, the democratic government spent whopping Rs 1.5 trillion on development projects, which was unprecedented in the country's history. Burmese democracy leader and Nobel Peace Prize winner Aung San Suu Kyi will be finally able to pick up the prestigious honorary doctorate she was awarded by Oxford University when she visits the UK later this year. She is also travelling to Norway this summer, where she will formally accept the Nobel Prize she was awarded back in 1991. The visits to Norway and the UK will be the first time in 24 years that she has travelled abroad. Visiting Oxford is an important part of her visit to the UK this June at the personal invitation of British Prime Minister David Cameron. Oxford is the city where she was a student, where her late husband, Michael Aris, was an academic and where she brought up her two sons, Alexander and Kim. A university spokesperson said, "We would be delighted to welcome Aung San Suu Kyi back to Oxford at any time. The university offered Suu Kyi an honorary doctorate in civil law in 1993, an award which is yet to be conferred for obvious reasons. We look forward to doing so as soon as she is able to visit Oxford." Suu Kyi grew up in Burma, India and the UK. Her father, General Aung San, was a founder of the Burmese Communist Party and a widely admired national leader who was assassinated six months before his country's independence. His widow, Daw Khin Khyi, was Burmese ambassador to India between 1960 and 1964. It was during this period that Suu Kyi went to high school and Lady Shri Ram College in New Delhi. Her mother's diplomatic contemporaries at that time included British High Commissioner to India, Sir Paul Gore Booth and his wife Pat, who became Suu Kyi's surrogate parents in the UK. It was at their home that Suu Kyi was introduced to her future husband. Suu Kyi, an undergraduate PPE degree from St Hugh's College, Oxford, left the University City in 1988 to return to Burma to care for her dying mother. Two years later in 1990, her National League for Democracy was victorious in the country's general elections, but the military junta, then in charge of running the country, refused to hand over power. She saw her husband for the last time in 1996 when he was diagnosed with prostate cancer. Dr Aris petitioned the military regime to let him visit his wife, but his visa application was rejected. Instead Suu Kyi was offered an exit visa to visit her husband, but, as there was no guarantee she would be allowed back into her country, she refused. She has been cited as telling the story of how both her sons implored her to return to the UK. "Imagine how hard it was to say no them,” she said. However, in the ballot's biggest surprise, nearly one in five voters chose far right candidate Marine Le Pen and they may hold the key to victory in the decisive vote on May 6. If Hollande wins the second round, he would become the first Socialist President since 1995. His election could also alter Europe's political and economic landscape at a time when the continent is seeking a clear direction to overcome its calamitous debt crisis. Polls taken on Sunday night continued to show Hollande is likely to best Sarkozy in their head-to-head match-up two weeks from now by around 10 percentage points in line with the trend of most polls for months. Both Hollande and Sarkozy resumed campaigning today after a two-day pause to comply with election regulations that forbid campaigning from midnight Friday until 8 pm on Sunday. 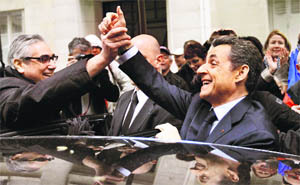 Sarkozy was headed to Tours in the Loire Valley, while Hollande travelled to Quimper and Lorient in far-western Brittany. Communications regulator Ofcom launched an investigation after Sky News admitted hacking into the email accounts of members of the public for information, adding another level of inquiry into the Murdoch media’s unethical news-gathering practices. Appearing before the Leveson Inquiry today, John Ryley, head of news at Sky News, separately admitted that his company broke the law by hacking emails of John Darwin, who faked his own death in a canoe to claim insurance money, and his wife Anne. Sky News had earlier defended the email hacking by claiming that it was in the public interest and amounted to "responsible journalism", but the claim was not repeated before the Leveson Inquiry. Rutte said he had offered his minority coalition's resignation to Queen Beatrix after a split with the populist Freedom Party, which had backed his government for the past 18 months, opening the way for elections possibly as early as June. Rutte said the Queen was considering the resignation offer and had asked the cabinet to keep working for the country's good. However, government ministers openly speculated that new elections would be needed to break the impasse.